Yesterday when I mentioned Bowman's return, I incorrectly listed BC's open scholarship as his. Based on multiple reports, Bowman's scholarship was still his. The open scholarship is the Robinson one and BC is using that to find a transfer. BC was in the mix for Mustapha Heron before he committed to St. John's. Multiple reports say that Drexel guard Tramaine Isabell is considering BC. Since both guys are guards it seems like that is BC direction. But considering Bowman being back and the small window, I hope they just grab the best guy they can get. After weeks of waiting, we now know that Ky Bowman is returning to play college basketball next year. With the return of an elite player, what should the expectations be for him and his teammates? I think Bowman will be first team All ACC and has the chance to lead the conference in scoring and assists. If he plays that well, BC will be a .500 team in conference and likely return to the Tournament. If Bowman doesn't play that well next year, then you have to question where he will stand with NBA teams. He met with plenty this go around. They see his size and understand his game. All that is missing is an explosive season and proof that he can make his teammates better. While the system isn't fair, I wish Bowman nothing but the best. He's been fun to watch. I now just want a happy ending. This is what we know -- Ky Bowman has until 11:59 ET Wednesday to declare his decision with the NCAA (and BC). He worked out for the Atlanta Hawks Tuesday. That's all we officially know. However, speculation remains rampant. Two separate tweets ( here and here) said that he is highly likely to come back to BC. BC has one basketball scholarship left. It would seem that the staff is holding it for him. We will know shortly if he will be using it. I know nothing officially. I just hope that he makes the best decision under the circumstances. Regardless of how the workouts have gone, not getting a Combine invite is a bad indicator of NBA interest. With Women's Lacrosse garnering so much attention, I failed to mention that last week the Women's Sailing Team won their respective National Championship. It was their third national title. It could be a busy few weeks ahead as their is a team race and a co-ed race (all for National Championships) in the near future. Before the championship game, below is the Semis vs Maryland. This is the youtube post for those who don't like the stream feed or don't have an ESPN account. The Boston College Women's Lacrosse team is one step closer to a National Championship after beating No. 1 Maryland Friday night. BC started a little slow and trailed during the first half. However, Sam Apuzzo got hot and lead the scoring charge in the second half. BC takes on James Madison Sunday for a chance at the school's first national championship in an ACC sport (sailing and hockey don't apply). Since Anthony Brown didn't play this spring, we have no idea where he is in his recovery and how his knee is. If you want to believe an internet video, Brown is doing just fine. Take a look below. Some caveats about the video. It is dated May 24, but we have no idea when it was actually filmed. The guy posting it is a private QB coach in New Jersey, so it would make sense that he knows and works with Brown. The players are away from campus, so it also makes sense that Brown would be working out at home. A few other caveats. One deep post doesn't mean a ton. Brown moves in the video, but we have no idea if he is able to move around defenders. We are still a long time away from official practices in August. I doubt Addazio will say much about Brown until then. However, this looks promising. And I will take promising during the dog days of summer. Once again many BC teams had perfect APRs and overall the Athletic Department remains committed to graduating their athletes. I admire those athletes. Most are out of the spotlight and have huge time and travel commitments. They are all more disciplined and hard working than I was at the Heights. I also remain proud that throughout different administrations, BC remains committed to graduating its athletes. What bothers me about trumpeting our APR score is how hollow it is nation wide. You have a program in UNC that created fake courses and grades -- yet were never punished -- talking up their APR. Florida State seemingly doesn't even try to graduate their players. I don't know whether to shake my head at them or admire that at least they are not pretending that Florida State football is anything other than a minor league. I will keep standing on my soap box, but college sports needs to change and I want BC to lead the change. Graduating Boston College athletes is noble. But we also need to give them real compensation for the revenue they bring in. We can't just rest on the value of a diploma when so many of our opponents devalue the educational experience and are not even trying to educate these kids. According to multiple insiders, elite prospect Oliver Wahlstrom will play for BC this year. He's verbaled to various programs already, but this seems firm. Wahlstrom provides an immediate scoring boost. He's also expected to be a top draft pick. Multiple reports confirmed that Jerome Robinson performed well at the NBA Combine. Most sites still have him as a first round talent. BCI had a good question and answer with a Maryland blog in preparation for the Lax Final Four. I'm a little nostalgic today because it has been 20 years since my graduation from BC. This year's graduation seemed to have a beautiful day and there was some Atlanta flavor as our Archbishop gave the commencement address. Congratulations to all the new Alumni. I wish you future success and plenty of good BC sports moments. Watch the video below. That was during the second OT as BC closed out Stony Brook in a back and forth thriller Saturday. BC will now get a shot at Maryland, the team that ended BC's season last year just short of a championship. BC released the TV schedule for the first two games and BC is not on TV (technically). Both the UMass and Holy Cross game will be broadcast on the ACC Network Extra, which is the ACC brand on the ESPN online platform. Given that they are local games, there is always the chance that a regional sports channel in New England could pick them up. The picture quality and production of these ACC games is greatly improved. My only complaint is that the internet games still have some lags and buffering. Our first game on traditional TV will be the Thursday night game against Wake. That will be on ESPN. When you are the most powerful conference, you tend to flex your muscle. The ACC is doing that on the basketball front. The league is making a proposal to expand the NCAA Tournament field to 72. They also want some general rule changes like, pushing back the 3-point line, shortening the shot clock and expanding the lane. Because the ACC tends to be one of the deepest leagues, the expanded tournament makes sense. It means one more team makes it. Because a few more game also means a few more dollars for the NCAA, I imagine this one will pass. The rules changes are trickier. The 3-point line is an equalizer. As is slowing down the game via shot clock. I am not sure changing the lane helps or hurts less talented teams. A faster pace game where the 3 is harder helps ACC teams when they are playing less talented teams. I don't know if the small schools will get on board and support those ideas. What would be in it for them? I would think the rules changes would be neutral for BC. Christian's team took a lot of 3s this year, but he is not tied to it like some programs. I think he would adjust his talent and approach as needed. The tournament field would help BC. Anything to get us back in the big dance would be nice. When his son decided to commit to Texas, some questioned Kenyatta Watson's loyalty to BC and his relationship with his Alma mater. Two scholarship offers from Wednesday should put to rest any lingering doubts that Watson is still a BC guy. Watson's son plays for a suburban Atlanta powerhouse Grayson. Kenyatta practically built the program as the vast majority of their players came up through his youth football program. Now BC offered 2020 targets QB CJ Dixon and 2020 DLine prospect Jadyn Bost. Both players tagged Watson in their social media reactions. Both seem very excited about BC's interest. Because of their profile every kid who takes the field at Grayson will be seen by every recruiter in the country. Having a BC guy -- who happens to work for Under Armour -- tied to the program is a great thing. I don't know if Dixon and Bost will ultimately land at BC, but I do know that Kenyatta Watson is still telling those Grayson players what at great place BC is. While it can constantly seem like something at BC is under construction, BC provided a mini-update and a picture on the project. The United States Supreme Court overturned the federal ban on sports betting opening up a whole host of opportunities for gamblers and sports leagues alike. No one knows the details, but it sounds like it will be a state-by-state deal, however, the online aspect will make that even less relevant. What we can assume is that there will be more gambling and therefore more money and interest in sports, including college sports like BC. Given our lack of clout in our state and in our conference, I don't think BC will be driving Massachusetts' rules nor the ACC's. We are just along for the ride. Yet even if our status or membership never allows us to get a percentage of the action, there should be a bump in ad dollars. DraftKings, which is a Boston company with BC-ties, announced already that they are going to roll out online gambling. I hope that they buy ad time and space from BC to help promote it. The increased revenue and interest is always going to be a good thing for BC. Every college program will have to deal with this issue. Given our history, BC must be hyper-vigilant. A third gambling issue would be a huge black eye. And if it happens when there is legal gambling, the story would be that much bigger and have more far reaching implications. CFN posted their BC preview and it is pretty thorough and pretty predictable. The season is going to come down to Dillon and Brown. Overall they also see us around the six or seven win mark...so more of the same. They are very optimistic about the OLine and the D bouncing back from last year's decline. What gives them concern is the schedule. They term it "brutal." I don't see it that way. Or at least not any more brutal than other recent schedules. There are three built in wins and that leaves Addazio to get three more out of the remaining nine games to get to a bowl. That's a low bar to me, not brutal. Overall, it is a fair and good preview and a reminder that Football is closer than we think. Former Boston College Basketball player Clare Droesch died Friday after a long battle with breast cancer. She was 36. Droesch is a BC Hall of Famer and a key player to one of BC's most successful basketball runs. While she was at the Heights, BC made four straight NCAA Tournament appearances and won the 2004 Big East Championship. Most prospects in that situation opt to return to school -- a total of 130 players have withdrawn from the draft in the last two years. But 47 of those players have opted stayed in the draft despite no combine invitation. None of those 47 players were drafted. I don't know where Bowman's head is or what the teams are telling him, but the odds are not in his favor. He is looking at being an undrafted free agent or maybe a second rounder. That is a tough road to make in as a NBA player. As unfair as the system might be, I think another year at BC is better than the G League or going to Europe. Sam Johnson might be part of a package as the staff followed up his commitment with a scholarship offer to his teammate. The staff remains scattered around the country on the recruiting trail. Softball lost to Notre Dame in the ACC Tournament. The "sleeper" talk has already started for the football team. We know from Ky Bowman's own Instagram that he worked out for the OKC Thunder. Now there are reports that the Houston Rockets are going to bring him in for a private session too. This is all good news for him but not great news for BC. Houston and OKC have been two of the better franchises when it comes to using second round picks. Both convert those options into contributors. Based on being passed over for the Combine we know that Bowman is not viewed as a first rounder. But these long looks from smart teams might lead him to gamble on being a second round pick. The downside for Bowman as a second rounder would be less money. One more strong year would probably get him into the first round next year. I am still holding out hope for a BC return but the more interest he gets, the less likely that becomes. Big news Monday for BC as Michigan QB prospect Sam Johnson committed to the Eagles. Johnson holds offers from Michigan, Syracuse, Iowa, and Mizzou among others. The major services have him as a three star recruit. Johnson is a pro-style QB who is currently very tall and somewhat skinny. My guess is the coaching staff expects him to fill out a bit as he matures and gets into a college program. He said all the right things in his media appearances with regards to the BC education and the environment around the team. He plans to enroll this winter. Good luck to Sam and welcome to BC. One of the advantages of being a student athlete at BC is that you can keep a relatively low profile (on or off campus). Many students are clueless when it comes to our players. That anonymity is nice most of the time. However, our athletes do deserve some celebration and acknowledgement. That's where the Golden Eagles comes into the picture. BC held an awards show for all sports and gave away awards across sports for academic and athletic excellence. Based on social media, it seems like the night was a success. Hopefully the players enjoyed it and this becomes an annual tradition. Reading through social media, you can see the coaches out on the road again and who they are talking to. Here are a few of the latest offers to football targets. This South Carolina DB also has an offer from Kentucky. 2020 target Texas WR Troy Omeire has an offer from plenty of big programs. Might be a tough sell. Texas 2020 DT prospect Chidozie Nwankwo also got an offer. I am always dubious of prospects who mentioned "Boston College University." This Maryland target is listed as a prospect. As we try to guess what will happen with Ky Bowman, the NBA has sent a pretty big signal that he is not likely to be drafted. He was not invited to the pre Draft combine. (Jerome Robinson was among the 69 invited.) If Bowman is a long shot to be drafted, coming back to BC makes much more sense. With Robinson gone and some young talent coming in, Bowman will be the primary offense. He can show the NBA everything in his game and also prove that he can carry a team. Bowman has until May 30 to make his decision. BC fans (including me) have long criticized the recruiting services for their biases and flaws in their evaluation. But our anecdotal examples of BC diamonds in the rough aren't enough to say the system is deeply flawed. But Football Study Hall did a fascinating breakdown of regional talent and how it later converts to the NFL. Long story short, the south has more talent depth, but they also have the region where the most recruits fail to live up to their respective hype. Take a look at the map below. 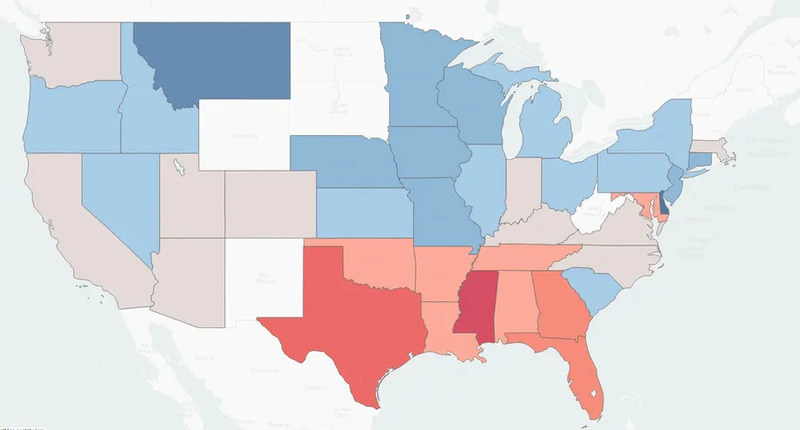 The red state represent overrated talent while the blue represent the states where the talent is more likely to over perform (in college and the NFL). What's interesting is that Massachusetts is one of the rare northern states that is not blue. What that means is that the local talent tends to be a little overrated. The good news is that New York, New Jersey and Connecticut are all underrated regions. I don't think BC should abandon the southern states just because the talent may not develop to the expectations, but I think this map reinforces the general belief that our region has underrated talent. I know the ACC Network has yet to officially start the channel. But they are off to a good start in my opinion. I feel like I have to revisit this topic every few years but with Kenyatta Watson and Anthony DiCosmo's sons deciding to play college football at schools other than BC, I decided to rehash the subject again (and this is getting even more personal for me as my kids age). I love BC. I know Kenyatta Watson and he loves BC. Like me, he is married to a BC grad. I don't know DiCosmo personally, but I am aware of his activity within the BC Alumni community and it is clear he has a great commitment to his Alma mater. But their connection to BC doesn't mean BC is the right school and the right football program for their children. This is not new. Gallup, Bosa, and Phelan's kids all went to schools other than BC. We've seen plenty of siblings play elsewhere. Football is a tough sport and college is a short and important window into a young athlete's life. He needs to find the right place for him. One where he is feels he can develop as a player and a person. Beyond fit, sometimes it is best for everyone when a kid takes his own path. When an high-profile Alumni child has a bad experience at BC, it resonates beyond just halls of the football offices. Fans know and other Football alumni definitely know. Plus, these critical fans tend to be hypocrites on this idea when it plays to our favor. Is everyone glad that AJ Dillon didn't go to Notre Dame? Big things are expected of Tate Haynes. Aren't you glad he didn't follow his dad's path at Arizona State? I didn't go to my parents' Alma maters. While my kids have been bombarded with BC stuff since they were born and I would love to be a BC parent, I ultimately want what it right for them. So don't take these commitments as some sort of snub of BC. Wish these kids luck because their dads will always be Eagles and would do the same for your kids.